Richard Benson was born in London in 1824 and was the youngest child in a wealthy family. His father was Thomas Starling Benson who was born in 1775. The Benson family came from the North Riding in Yorkshire. Thomas Benson was a business man and had an interest in the Meux brewery which was based in London in Liquor-Pond Lane, now Clerkenwell Road. He married Elizabeth Meux (his third wife), heiress of the brewery. Her family, originally from Meaux in France, settled in London some time in the eighteenth century and the brewery was founded soon after. Mr Benson was High Sheriff of Camberwell in 1810, and a member of the Worshipful Company of Drapers, which was one of the principal three ancient City Companies. Richaed Benson retained his father's membership and continued to vote in the city. He boasted that he was the third oldest draper in the country at age 85. Richard had an older brother, Henry, and two sisters who died young. There were also two girls and two boys from his father's former marriages. Mr Benson's eldest son was in the Army and the next was in business. The second daughter married, but died three years after the family moved to Wales, leaving an infant daughter, who Mrs Benson adopted (her step-granddaughter). The family had a large house in London (Russell Square) and another in the country, Sanderstead Court. The Benson family (including Richard's maternal grandmother) moved from Sanderstead Court when Richard was a small boy to a very large house called North Cray Place, fifteen miles from London. The family moved again to Sketty Park near Swansea in 1833 when he was nine years old. Although the railway had opened three years before it was still considered risky, so they traveled in the family carriage. On the way to Wales the family spent a week in Oxford. Elizabeth Benson's health seemed to deteriorate in the late 1830s and she went to Boulogne in 1837 to stay in a chateau for some months. She, like her husband, was a devout Christian from the Evangelical tradition, and was a strong religious influence in her son's life. In the summer of 1842 Richard and his half-sister Sarah went to Kissingen in Germany as she was 'delicate' and had been ordered to drink the waters there. They made many friends at Kissingen and the visit was a great success, so that he and Sarah returned the following year. Her health gave cause for concern and she was advised to spend the winter in Rome. In late August 1843 they traveled to Rome via Karlsruhe, the Alps and Switzerland, Milan and Florence. In Rome they made friends with many religious communities and particularly with two Cardinals, Mezzofanti, a great missionary leader, and Cardinal Acton. Richard and Sarah received a private audience with Pope Gregory XVI. 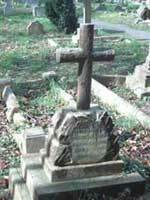 The family were affected by the Indian Mutiny of 1857, with Richard's brother Henry being posted with his regiment to India. Richard raised his concerns for the suffering people in India in his parish and asked for a 'fast day for the Indian Mutiny.' One of his nieces was left widowed as a result of the conflict. Richard's father died in 1858 and his mother in 1859 when Father Benson was aged 34. Richard Benson did not go to boarding school like his brothers but was educated at home by a tutor. He applied twice for a Balliol scholarship and was unsuccessful both times. Eventually he was accepted at Christ Church and went there in 1844. He lived in rooms in Fells Buildings which he described as 'dilapidated.' At this time men who went to Christ Church were mostly men 'of money', or from 'great families of England' who had made friends at school. Despite not coming from this background Richard Benson made many friends, amongst them was Charles Dodgson (author of Alice in Wonderland).��� Many of his friends knew that he wanted to be a priest. His ambition to serve as a missionary in India dates from this time. Despite his Evangelical background, Richard Benson was very influenced by the Oxford Movement, whose central aim was to 'restore the High Church ideals of the seventeenth century' (Oxford Dictionary of the Christian Church). Keble, Newman and Pusey were among its main proponents in Oxford. He worked hard at Christ Church and, after being nominated by Pusey, was elected a Student of the college at Christmas 1846 (the equivalent of a Fellow of other Oxford colleges). Studentships at that time were given for life and meant taking priest's orders and not marrying. In October 1847 he received his Bachelor's degree. He studied Hebrew under Dr Pusey and won a Kennicott Hebrew scholarship and received his Master's degree in 1848. Richard Benson was ordained deacon by Bishop Samuel Wilberforce in Cuddesdon, Oxfordshire (where the Bishop's palace was) on Trinity Sunday in 1848, and was ordained priest in 1849�� He started pastoral work as assistant curate to the vicar of St Mark's at Surbiton in 1848. This was a small church but was enlarged later with Father Benson's money. 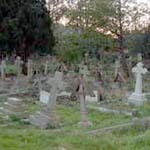 It was near the family home in Teddington and his mother would often come to services. He was very popular amongst both the rich and the poor in the parish, participating well in social events. 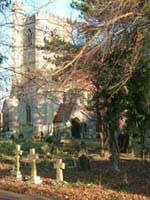 Whilst he was at Surbiton he was offered the parish of St James in Cowley. He moved to Cowley to take this position in December 1850 and lived alone in a cottage which was 'little more than a labourer's home.' One of his friends from Christ Church, Henry Parry Liddon, who had been made a deacon at Wantage in 1852, visited him regularly. His mother took lodgings nearby and helped with the work in the parish. Sometimes she brought several of her son Henry's children. She and the girls would drive to visit Charles Dodgson and the girls are in his collection of photographs. Liddon and Mrs Benson were said to have a very close friendship. Cowley Parish included the newly developing area of east Oxford and Father Benson witnessed the progress of the residential development. 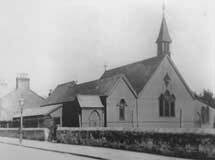 He arranged the construction of the Iron Church in Stockmore Street which was opened on 19 October 1859, dedicated to St John the Evangelist. He planned to go to India for missionary work and had permission from the Bishop, but at the last minute was ordered to stay in east Oxford as he was needed to develop the new parish. In 1860 he moved to lodgings in the Iffley Road, just round the corner from the Iron Church. In 1869 he became the first vicar of the Parish of Cowley St John. 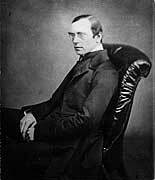 His friend Thomas Chamberlain, Vicar of St Thomas', helped out with some of the work at the Iron Church. Father Benson preached regularly and his sermons, packed with knowledge, could last as much as three hours. Requests for his preaching came from London churches. Father Benson also participated in many parish social activities such as cricket matches, parties and f�tes. He often visited the schools that he had established, distributing sweets to the children. 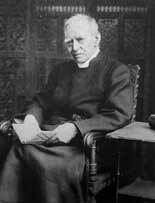 In 1886 he resigned his position as vicar of Cowley St John and William Scott took over. Alongside developing parish work, Father Benson also developed international mission work. On the feast of St John the Evangelist, 27 December 1866, Father Benson, Father Grafton (from Boston) and Father O'Neil took their vows and formed The Society of St John the Evangelist, the first Anglican religious community of men to be formed since the Reformation. Their mission house, initially at Magdalen Terrace on the Iffley Road, moved to Marston Street in October 1868 as the Society expanded. 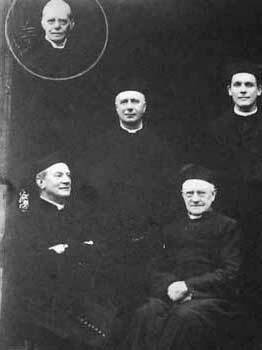 It became the centre of international and national mission work (see fact sheet on Religious Orders). The fathers, who wore long cloaks and big round hats, became a familiar sight in the area and were known as the 'Cowley Fathers.' International work expanded. In November 1870 Father Benson went to America, where he started a branch of the Fathers there. He was away for nine years. Branches of the Society were established in India and South Africa and there was an increasing number of visitors to the Mission House in Marston Street. As the Society grew, a new church was deemed necessary and was built adjoining the Mission House on the Iffley Road. 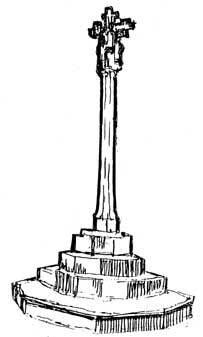 It was dedicated on 12 May 1896. Father Benson had stepped down as Superior of the Society in 1890, but remained a member all his life. Fee-paying schools had been set up in the area but many local families could not afford to send their children to them. 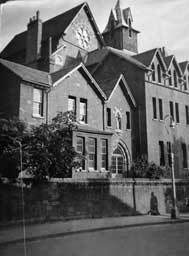 Altogether Father Benson established four schools: the Robin Hood School (now SS Mary & John Primary School), an infants' school, a boys' school and a girls' school. Initially fees were charged, though less than those charged at private schools, but these were abolished in 1891 after the Free Education Bill. More information is provided in the fact sheet on schools. In January 1867 a coal and clothing club was started. By paying a weekly amount subscribers were guaranteed clothing and coal. Financial payments spread over weeks made this easier for people on low incomes. Payments were made on Mondays between 10 and 11 am at the school house on Iffley Road. The cost was 3d per week for 48 weeks for clothing and 6d per week for 24 weeks for coal. There were 109 subscribers to both clubs in 1867. This club for pregnant women was started around January 1867 with similar principles as the coal and clothing club. Regular payments of 3d a week for 24 weeks at the school house on Iffley Road, at the same times as coal and clothing club, entitled a mother to the loan of baby linen. The baby linen had to be returned at the end of the first month after birth. A soup kitchen for the St John's district was opened on Friday 25 January 1867, at Mr Castle's Brickyard in Stockmore Street . Soup was served three times a week for 1d a quart. A Committee of Management consisted of Father Benson, Church wardens, overseers, Guardians of the Poor, Sir Benjamin Brodie, Mr Joseph Castle, Mr George Castle, Rev H Dixon, Mr Hind and Mr Owen. Donations were collected towards the running of the soup kitchen. Mr Joseph Castle, a local business man, delivered coals free of charge to the homes of poor people in 1868. From 1867 adult education was organised in a variety of ways in the area. The school rooms in Cowley Road and at Robin Hood School were the usual venues. Lectures and concerts were held at the school room in Princes Street. Adult girls' classes were run from the school at Robin Hood Terrace in 1868 and in the evenings the schoolroom was open as a reading room for men. Similarly, in January 1883, local photographer Mr Taunt gave a lecture with scenes from the late war. Regular talks on the mission work were also given at the schools. A reading room was established at Princes Street in 1871 and was open between 6.30pm and 10pm. For a charge of 1d per night, or 2d per week, or 1/6d per quarter, newspapers, periodicals, books and games were available. The reading room was managed by a committee of twelve, and members had to be over 16 years old. Instruction in reading, writing and arithmetic was held every Wednesday and Friday from 7.30pm to 8.30pm, and cost 1 shilling per quarter. Lectures and entertainment were given quarterly. Two Guilds were set up in the area. These were St Agnes and St Vincent Guilds and they met regularly, did work for charity and had social events for people in the parish. One of the organisers of the St Agnes Guild was Miss Pieritz, daughter of Reverend Pieritz, and she was presented with a clock as a token of gratitude for organising the Guild for 5 years. A Mothers' Meeting was set up in June 1871 and meetings were held weekly in the parish room. A Junior Temperance Society was formed in August 1877. Father Benson and several of his colleagues from the mission house were on the committee. After the first meeting in September there were 120 members aged between 7 to 16 years of age, who met weekly and paid 3d a week for instruction and entertainment. This was the pledge they made: 'I hereby promise to abstain from all alcohol drinks, except for religious purposes or under medical order. '� Special events were organised for anniversaries and celebrations like Christmas and Easter, with teas and magic lantern shows. For example, Keble College members gave a show; missionaries came to talk to the group about their work, such as Father Black illustrating his mission work with an account of 'heathen habits' and the habits of the wild beasts; Reverend Ellis spoke of his experiences in Canada. On New Years Day 1869, 103 residents of the district at Robin Hood met for supper provided by the Sisters of Compassion. The children had a Christmas tree and entertainment. In December 1872 the 'labouring men' from Robin Hood had supper provided by Mr Barling (who was once the head of Cowley St John Middle Class School). Father Benson founded a variety of local societies. For example, the Horticultural Societywas formed in April 1868, and Cowley St John Musical Society was formed in 1869 with Father Benson as president. Later a Vocal Society was also formed and supervised by Father Wyon, with Mr Rogers as treasurer, Mr TW Tidmarsh as librarian and Mr Dickinson as secretary. Cowley St John Needlework Society, established in 1869, had a dual function - it� provided industrious women with employment, and sold the work at a cheap rate. Several parish outings were organised and ranged from the choir visiting another parish, Hughenden, to Sunday School trips and sports competitions. One Sunday School outing in 1875 took a party of 500 children on two houseboats from Christ Church Meadow to Nuneham. The group left at 11am and returned at 9 pm when they sang 'God Save the Queen' before going home. Other trips were organised to Blenheim and Mr Morrell held summer celebrations in South Park, where 700 children were entertained. A big event was organised in August 1885 by the High Sheriff in the South Park for 2300 school children, 1000 from east Oxford schools. There were swings, merry-go-rounds, Mr Punch and games, and the children were given a bun and a packet of sweets to take home. A.M.Ramsey, 'The message of R.M.Benson', Canterbury Pilgrim, (London: SPCK, 1974) pp 69-73. Miscellaneous archives from Ss Mary & John parish church. Jessie Parfitt, The Health of a City, (Oxford: The Amate Press, 1987). M V Woodgate, Father Benson, Founder of the Cowley Fathers, London: Geoffrey Bles, 1953).